Last night I made spaetzle. This may be the one and only time I actually make it from scratch. I’m still traumatized. Spaetzle is a kind of an egg noodle pasta dish that is popular in Germany, Switzerland, Austria, and Hungary. It means “Little Sparrows” in old German. I have no idea why. It doesn’t look like a sparrow and I can only assume it doesn’t taste like a sparrow. You can find Käsespätzle (cheese spaetzle) on the menu in any restaurant here. It is delicious. 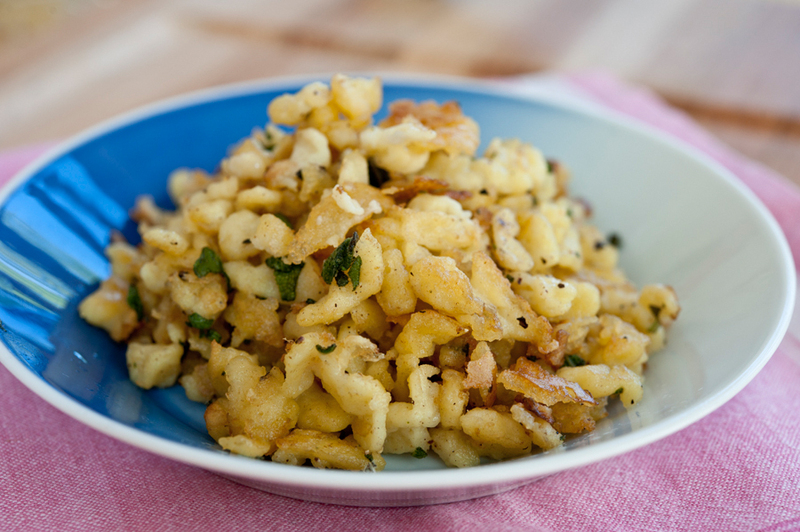 Spaetzle is mixed with a type of cream cheese and topped with Gruyere cheese and fried onions. It is baked in the oven until the cheese is melted and a little brown on top. It is the epitome of comfort food. I see great huge packages of plain spaetzle sitting in the cooler bins of the market. I always see other Swiss people pick it up and throw it into their baskets. I have been curious about them, but I don’t like to buy ready-made things. Sometimes manufacturers use a preservative that upsets my stomach so I have to be careful. However, I love it so much I wanted to learn how to make my own so I didn’t have to pay Basel’s exorbitant dining out prices or chance an evening with an upset stomach. Tasty Kitchen has a great recipe for it with step-by-step picture instruction, if you are willing to give it a shot. She uses dried mustard. I used nutmeg from Wolfgang Puck’s recipe. This is a picture of Tasty Kitchen’s spaetzle. I neglected to take photos of my own due to the trauma of making it. Making the batter or dough is easy enough. Just mix the flour together with the spices, eggs, and milk. Then you have to let it rest a long time. Wolfgang (and I feel like this experience has earned me the right to be on a first-name basis with him) says you can rest it as little as an hour, but it is preferable to have it sit in the fridge overnight. My batter was in the fridge for 8 hours. The trick comes in the cooking of it. You have to force it through something and into salted, boiling water to make it into those little “sparrows.” First I tried a colander, like Wolfgang suggested. I just ended up with a gooey mess that clung to the underside of the colander – well the little bit that would actually let itself be forced through the colander. Then I remembered an episode of Chopped where a guy got spaetzle into the boiling water by using a squeeze bottle. So I hunted out an old water bottle from one of our drawers. I forced several spoonfuls of the sticky mass into (and down the side of) the bottle, capped it, and squeezed it for all I was worth. All that I got was a cramp in my hand and a teaspoon full of batter into the water. I abandoned that tactic and did my best to scoop the batter out of the bottle. I ended up leaving about a half cup behind from sheer frustration. Then I got out a slotted spoon and tried to force the batter through those slightly larger holes. The batter just oozed over the edge of the spoon. At that point I was done with utensils. My sink was heaped with goo-filled items and batter was smeared across my counter top. Frankly, I didn’t have anything left to use. So I just decided to use my fingers. I scooped up batter in my hands and tried to pull it off my fingers in long strands. It was hot standing over my giant Le Creuset cauldron with beige glue covering both my hands and creeping up my wrists. However, this method was incredibly successful if messy. Once I finally got all the batter into the boiling water I let it cook for an additional 2 minutes and then used my Chinese spider strainer to scoop the spaetzle out of the pot. I had a bowl of ice water waiting and plunged the spaetzle into it and stirred it around until the ice melted. Then I strained it again, let it dry in a colander, and coated it with oil and salt&pepper. Then I got to the awesome cheesy part. I put the spaetzle into an oiled 9×13 pan and topped it with some delicious grated Gruyere cheese. I skipped the onion topping because I just didn’t have it in me to fry onions after my wrestling match with the batter. The spaetzle went into a hot oven and I sat on the floor with a cup of tea to watch the cheese melt. When the cheese was melted and slightly browned I took it out of the oven and served it with some pan cooked Kalbsbratwurst and a salad. It was delicious. Even E liked it. He thought it tasted like macaroni and cheese. H, however, did not like it, not even with ketchup. Not even with the bribe of having some Halloween candy afterwards. Well, I guess you can’t please everyone. Keep writing – you bring smiles and joy to my morning. Thanks, Kay! I’m glad you enjoyed it.